Hitchcock said a good story was life with all the boring parts taken out. Watson continues in chapter two by jumping ahead in the history of interpretation of the Gospels to the 1777-79. The Enlightened critics agreed with Augustine that contradictions in the gospels would seriously compromise the integrity of the gospels themselves. Watson focuses on two characters and their differing views, Gotthold Ephraim Lessing and Hermann Samuel Reimarus. Reimarus argues that the gospel narratives cannot be harmonized and therefore are false. Lessing develops a position which acknowledges the individual integrity of the gospels while seeing them as deviating from the original truth embodied in Jesus. Although Augustine would have been outrages by Reimarus’s conclusions, he could have had no objection to the assumption on which they are based: that the veracity of the gospel narratives depends on the possibility of harmonizing them with one another and with prior historical reality. In his role as counsel for the defense, Augustine operates within the same law-court setting as Reimarus (77). Watson then goes into more depth about Lessing’s views through both the form of a parable and a critique of gospel harmonization. Lessing’s parable is about a king and his palace. The palace is old, large, and irregularly constructed and remained unaltered for years. Connoisseurs of the architecture (who had never been inside) thought the palace had insufficient windows thinking they could not emit enough light. But the connoisseurs disagreed with each other about what exactly must change as they only knew the building from the outside. But there are not only connoisseurs, there are also antiquarians who are in possession of documents of the ground plan drawn up by the original builders. Unfortunately, their words and symbols are hard to interpret and therefore interpret these words and symbols as seems good to them and seek to re-construct the building based on their interpretation of these documents. The palace is Christianity, the modernizers are the Enlightened critics. They flip the old palace with a new one more suitable in their eyes. The inspired palace turns into an uninspired palace put together by themselves which no one quite agrees on. The antiquarians are those who insist that these texts are foundational to Christianity yet do similarly to the modernizers. And this is where Watson (via Lessing) include a third group. Having been introduced to the Modernizers and the Antiquarians, we now meet a third group, fewer in number, who dare to question whether the ground plans are of any real significance at all. “It is enough,” they say, “for us to experience every moment that the most benevolent wisdom fills the whole Palace, and that from it nothing but beauty, order and well-being are spread across the whole land.” These Questioners interpret the ground plans more successfully than the Antiquarians, precisely because they are not committed to their absolute truth and validity; and they are promptly denounced as arsonists conspiring to burn down the Palace (81). Lessing and Reimarus are identified with the questioners. With the parable and characters introduced Lessing provides an event in which the Questioners are vindicated and the Antiquarians are put to shame. There is a fire in the palace. The antiquarians concerned only to save their ground plans and so they run out into the street with the plans and argue about where the fire came from. Although they cared that the fire burned the Palace to the ground, they saved the documents. But in fact there was no fire, the watchmen had been mistaken. The northern light is what the watchmen had seen. The Letter is not the Spirit, and the Bible is not Religion. Consequently, objections against the Letter, and against the Bible, are not objections against the Spirit and against Religion. For the Bible clearly contains more than what belongs to Religion; and it is purely hypothetical that it must be infallible even in this surplus. Also: Religion existed before there was a Bible. Christianity existed before evangelists and apostles wrote (83). So for Lessing since the scriptural histories are secondary the contradictions do not matter (85). They signify that for the Christian faith textuality is secondary and scripture superfluous. That is what we are intended to learn from the parable of the palace. Therefore the harmonization of the gospels should be abandoned. As Watson says, harmonizers substitute a composite narrative of their own devising and give priority to the historia Christi. Lessing gives priority to the textuality of the gospels. Although I thoroughly enjoyed this chapter I was also confused by it. Mainly, because it was hard for me to distinguish between Lessing’s voice and Watson’s voice. I could not figure out if Watson was describing or prescribing Lessing’s view. There seemed to be some affinity with it for Watson for Lessing cut the Gordian knot between the connoisseurs and the antiquarians. But I also think that Watson himself holds more tightly to the historical event than Lessing. I could be wrong but later on in the book there is some evidence of this. If he does not then this chapter becomes a project in first infusing the text with significance, meaning, power, authority and then draining it of its power. N. D. Wilson’s Death by Living: Life Is Meant to Be Spent (Thomas Nelson) isn’t exactly an apologetic for YOLO, but it is cut from similar cloth. Technology, globalism, and social media give our contemporary world an especially palpable sense of ephemerality. YOLO, aided by a mortality-denying consumer culture, translates this into narcissistic YouTube tomfoolery, “sexting,” and SnapChat (the new no-paper-trail social media fad). But Wilson wants us to lead lives that lean into time and run toward death, after the model of Christ. Death is not a shadow to be feared or an abstraction to put out of our minds. Rather, it is a part of God’s creational good, a beautiful reminder of the brevity of breath and the urgency of life. Sounds like a breath of fresh air. Go out and get this one. 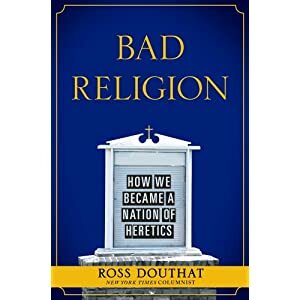 As the youngest-ever op-ed columnist for the New York Times, Ross Douthat has emerged as one of the most provocative and influential voices of his generation. In Bad Religion he offers a masterful and hard-hitting account of how American Christianity has gone off the rails—and why it threatens to take American society with it. His urgent call for a revival of traditional Christianity is sure to generate controversy, and it will be vital reading for all those concerned about the imperiled American future. Michael Bird posts his top 10 books for NT Graduate Students. What would you add? 1. Textual Criticism: David Parker, An Introduction to the New Testament Manuscripts and Their Texts. 2. NT Greek: Stanley E. Porter, Idioms of the Greek New Testament. 3. Christian Origins: Christopher Rowland, Christian Origins. 5. Gospels: Martin Hengel, The Four Gospels and the One Gospel of Jesus Christ. 6. Paul: F.C. Baur, Paul the Apostle of Jesus Christ. 7. Paul: James Dunn, Theology of Paul the Apostle. 8. Catholic Letters: Robert Wall and Karl-Wilhelm Niebuhr, The Catholic Epistles and Apostolic Tradition. On June 30th Crossway will be publishing the book Kingdom Through Covenant by Peter Gentry and Steven Wellum. I had both of these professors in Seminary, and Gentry’s analysis of the covenants were helpful handles for understanding the vastness of the OT. Wellum is one of the clearest, most nuanced systematic theologians out there. Here is the description of the book. Many theological discussions come to an impasse when parties align behind either covenant theology or dispensationalism. But Peter Gentry and Stephen Wellum now propose a significant biblical theology of the covenants that avoids the extremes of both classical systems and holds the potential to break the theological impasse. Kingdom through Covenant is not a system-driven work, but a careful exposition of the covenants as key to the narrative plot structure of the whole Bible. Kingdom through Covenant emphasizes the importance of the covenant concept throughout Scripture, showing that crucial theological differences can be resolved by understanding how the biblical covenants unfold and relate to one another. Rather than looking at covenant as the center of biblical theology, the authors show how the covenants form the backbone of Scripture and the key to understanding its overarching story. They ultimately show that the covenant concept forms a solid platform for systematic theology. By incorporating the latest available research from the ancient Near East and examining implications of their work for Christology, ecclesiology, eschatology, and hermeneutics—Gentry and Wellum present a thoughtful and viable alternative to both covenant theology and dispensationalism.